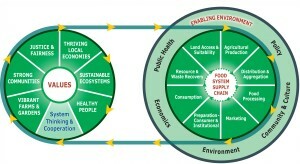 The CFS Toolkit is based on a framework developed by CRFS to link Whole Measures values like sustainable ecosystems and healthy people, to food systems activities and their enabling environments. Below, the framework is visualized as bike gears, where values drive the system. 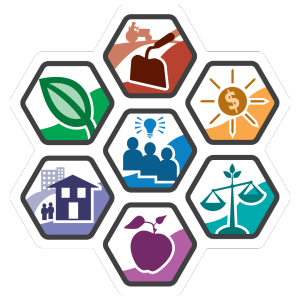 The CFS Toolkit uses the framework to categorize a collection of action-oriented resources; these resources are the “tools” curated to support practitioners and community groups to plan, implement and evaluate community food system initiatives. Each tool has been briefly described by CRFS framework components: Whole Measures value, food system area, enabling environment factor, and program development & evaluation stage. “This toolkit builds on the Whole Measures for Community Food System value fields developed by the Community Food Security Coalition and the Center for Whole Communities and adapted by the UW-Extension’s Community Food Systems Team. Users can search the CFS Toolkit by selecting specific framework components to filter the tools or can browse through a complete list of tools. Stewardship of the CFS Toolkit transitions from CRFS to the UW-Extension Community Food Systems team this February, 2016. In order to enhance the utility and expand the reach of the toolkit, CRFS and the Community Food Systems team have launched a collaborative effort to advance the second phase of toolkit development and dissemination with assistance from the eXtension i-Three Corps. Their joint proposal to i-Three Corps, a new national initiative to support Cooperative Extension work on food systems and climate change, was selected as a project finalist. Plans include developing trainings and workshops on how to use the toolkit, researching and expanding the resources included and conducting user experience testing to improve the platform. CRFS Project staff Lindsey Day Farnsworth and UW-Extension colleagues Carrie Edgar and Erin Peot will participate in the inaugural iThree Corps training series and represent the project at the national e-Extension conference in March 2016. CFS Toolkit Presentation Power Point Slides, February 2016. For more information, please contact Erin Peot, erin.peot@ces.uwex.edu.